The Bank of Uganda sold Crane Bank (CBL) and others like Global Trust Bank (GTB) without holding a board meeting and therefore, there was no minutes upon which the transactions were based, inside sources have said. BoU Governor Emmanuel Tumusiime-Mutebile heads the board as Chairman while his deputy Dr. Louis Kasekende is his vice. However, it is said some of the members who made up the board at the time when the banks were being sold left at the end of their term. Sources at BoU now say there is a plan to have those members back so that the issue of not having minutes is resolved. Thus there is likely to be some kind of forging the meeting and its minutes subsequently. Yesterday parliament gave BoU officials up to Monday to avail procedures, manuals and the list of the then board members who presided over meeting about all defunct banks starting from Teefe bank in 1993 to Crane bank in 2016. Members of parliament’s committee on Commissions, Statutory Authorities and State Enterprises (COSASE) chaired by Bugweri County MP Abdu Katuntu tasked the officials to produces inventory report, customer deposits, loan schedules and other supporting documents before and after the closer and sell of these banks. Katuntu said, the process is aimed at seeing that in case any other bank is to close in the future, the processes are handled better and with accordance to the law. “This process is therefore, equally good for the past and future. The committee is going to consider all the banks in order of how they were closed, from Teefe bank in 1993 to Crane bank in 2016, “I see a lot of misconception that this is about one specific bank,” He said. Alluding to page five of the Auditor General’s report, Kasilo County Member of Parliament, Elijah Okupa implored BoU officials to provide reports from bank supervision departments for at least two years before the closer of these banks. Citing page 12 of the Auditor General’s report, Okupa said, BoU should also produce an Interim order that restrained the supervision body of banks leading to the closer of National Bank of commerce (NBC). COSASE Vice Chairperson and Woman Member of Parliament for Bukedea District Anita Among, said officials should also come along with the minutes of all previous meetings under the subject to matter for closer and selling of the banks. 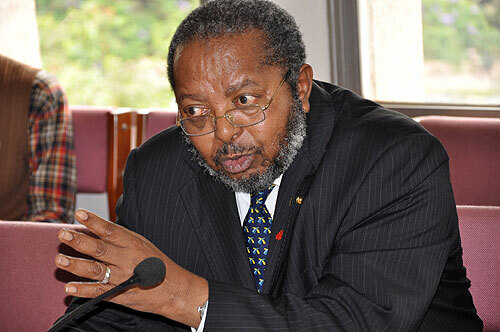 Governor of the Bank of Uganda, Emmanuel Tumusiime Mutebile, said they have all the alluded copies answering all the queries raised by committee members and asked for two working days to table them before committee which was accorded to them. The Auditor General (AG) John Muwanga also in his recent special audit report of BoU on seven defunct banks says BoU transferred Performing Loans and Overdrafts transferred worth Shs22,630,112,656 representing 80o/o of the book value of Shs28,287,640,820 which meant that that Dfcu acquired the loan portfolio at 20 per cent discount. “Interviews with BoU management indicated that the transfer price was agreed upon after negotiations with the purchaser, however negotiations minutes of the P&A were not provided,” Muwanga says. Furthermore, Muwanga adds, the evaluation of the alternatives and assumptions on which the evaluation was based were not provided for verification. “Therefore I could not determine the Justification for transferring the Performing loans at a 20 per cent discount,” he says. CBL was placed under statutory management from October 20, 2016 to January 20, 2017. During this period. The Statutory Manager did not prepare a plan detailing efforts to return the bank into compliance with prudential standards despite BoU injecting Shs478.8 billion to support the operations of CBL. “In absence of any documented assessment to revive the bank, I could not provide assurance as to whether Sections 89(5) and 90(a) (c) of the FIA 2004 was complied with,” he says. Relatedly, he says the Statutory Manager prepared CBL annual report and financial statements for the year ended December 31, 2016 but these were neither signed by BoU nor the auditors. Furthermore, he says the Statutory Manager did not provide financial statements for the period January 1, 2017 to 25th January 2017 (P&A completion date) and therefore the AG was therefore unable to ascertain the financial performance of CBL during statutory management and its financial position as at January 25, 2017. “As such, I was also unable to establish the details and values of assets and liabilities transferred to Dfcu,” he says. Next articleWhat next for Dfcu Bank after recruiting top managers Sekabembe and Katamba?